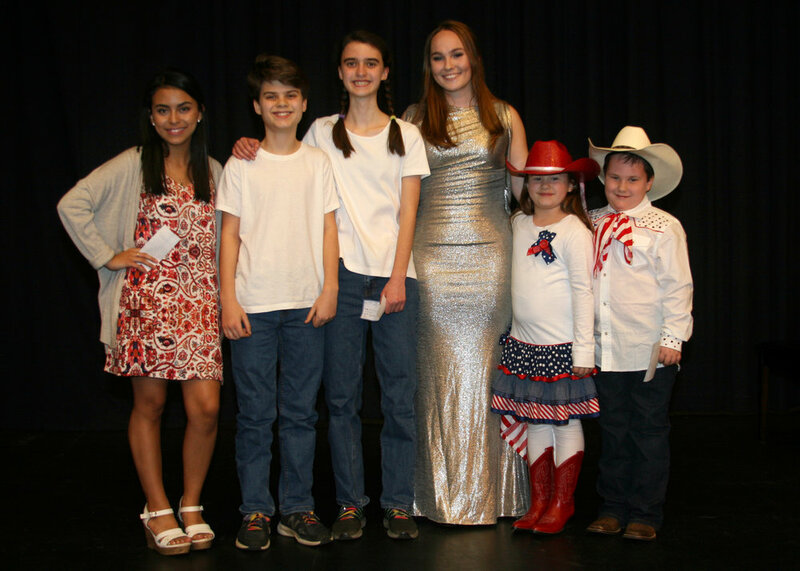 Local students take prizes in second-annual "Sing and Play"
SILER CITY, N.C. — Several local students took top prizes last night at “Sing and Play ’19” during a spirited musical competition at Jordan-Matthews High School. The second-annual showcase was a benefit concert for JMArts, the Jordan-Matthews Arts Foundation. Audience members voted Jack and Jillian Dixon of Silk Hope School as best performance in the elementary division on the strength of their performance of the bluegrass favorite “Old Rattler." Buck and Maggie Thornton of Chatham Middle School received the most votes among middle schoolers for their rendition of “When Will I Be Loved,” a song written by Phil Everly and recorded by The Everly Brothers. And in the high school competition, Jennifer Trejo Benitez of Jordan-Matthews High School came out on top thanks to her vocal performance of “Consequences,” made popular by recording artist Camila Cabello. In all, 17 students competed for prizes with the winner of each age-based competition receiving a $50 award. "Sing and Play" was organized as a benefit for JMArts. All money raised by the competition will be used by JMArts to provide opportunities for high school artists, including its second-annual New York Arts Adventure. That trip scheduled over spring break gives upperclass musicians, actors and visual artists an opportunity to explore one of the world’s great cities, experience the very best in the arts, and gain new perspectives and experiences that will influence their lives and work. The students will enjoy the opportunity to meet and learn from Broadway actor Andy Grotelueschen, noted graffiti artist JCORP and Washington Post Chief Theater Critic Peter Marks. Musicians from Chatham County and beyond were eligible to audition for the showcase concert. About 40 musicians auditioned in early February with showcase contestants selected by Burriss and musician Joseph Walden. Pate expects “Sing and Play” to return next year with registration for auditions opening sometime around December 1. JMArts is already looking at possible dates for next year’s competition, which is likely to be held once again in mid- to late-February. More information about “Sing and Play,” including photos from this year's auditions and showcase concert, is online at facebook.com/JMHSArts. Details about JMArts and other events scheduled for this season are available at jmarts.org. SILER CITY, N.C. — Applications for 2019 JMArts Scholars are now being accepted on a rolling basis through April 1 for students interested in intensive study this summer in the arts. Current JM freshmen, sophomores and juniors are eligible to apply for scholarships allowing them to study the arts this summer. Most attend weeklong, residential workshops offered on university campuses, though other arts educational offerings are considered as well. Since being launched in 2012, the JMArts Scholars program has awarded 54 scholarships to 36 students who develop their talent, explore artistic options before making their college decisions and bring what they learn back to share with other JM students. Scholarships are funded by individual contributions to the foundation, community fundraisers and ticket sales for the fall musical and major concerts during the academic year. Additional financial contributions to fund summer scholarships are now being accepted on the JMArts website, Facebook page and through the mail. Students must complete the 2019 JMArts Scholars application online no later than April 1, but are encouraged to apply as soon as possible, since some decisions will be made earlier than the deadline, allowing students to secure spots in some of the high-demand workshops. A list of some workshops statewide is available from the JMArts Scholars application. More information about the program — including a list of all JMArts Scholars since 2012 — is available online at JMArts.org. SILER CITY, N.C. — Showcase contestants have been selected for “Sing and Play '19,” the second-annual musical competition scheduled for February 21 at Jordan-Matthews High School in Siler City. The showcase concert highlights talented student musicians and raises money for JMArts, the Jordan-Matthews Arts Foundation, a nonprofit organization created to provide what student artists need to excel. Eighteen musical acts selected during auditions will perform in separate elementary, middle and high school competitions. Elementary contestants are Brianna Balderas of Siler City Elementary, Jack and Jillian Dixon of Silk Hope School, Destiny Lyna Lowery of Chatham Charter, Hanna Mikolajec of Perry Harrison Elementary School, Zoe Murphy of Virginia Cross Elementary and Adrian Willett of Perry Harrison Elementary School. Middle school contestants are Carolyn England of J.S. Waters School, Ian McMillan of Chatham Middle School, Zuzanna Mikolajec of Margaret B. Pollard Middle School, Cameron Parker of Praise Homeschool, Buck and Maggie Thornton of Chatham Middle School, and Marcella Willett of Margaret B. Pollard Middle School. The showcase will conclude with six high school performances. Courtney Shackelford, Jennifer Trejo Benitez, Jackie Vasquez and Amari Yarborough compete from Jordan-Matthews High School. Duan Bowen and Faith Tysor represent Chatham Central High School. “Sing and Play” is open to both instrumental and vocal acts, with students competing for a $50 prize in each age division. Winners will be selected by audience vote during the showcase concert on February 21, at 6:30 p.m.
General admission is $5 per person and includes one vote in each age-based competition. All money raised by the competition will be used by JMArts for educational projects, including its New York Arts Adventure. That trip scheduled over spring break gives upperclass musicians, actors and visual artists an opportunity to explore one of the world’s great cities, experience the very best in the arts and gain new perspectives and experiences that will influence their lives and work. Not only will travelers attend performances at the Metropolitan Opera, Jazz at Lincoln Center and on Broadway, but they will learn from world-class professionals. That includes discussing theater over lunch with The Washington Post chief theater critic Peter Marks; seeing the new Broadway musical “Tootsie” and learning about the show afterward from actor Andy Grotelueschen, who plays the role of Jeff Slater; and exploring street art on Manhattan’s Lower East Side and learning graffiti technique in a hands-on workshop with noted artist JCORP. More information about “Sing and Play” performers will be available online at facebook.com/JMHSArts. Details about JMArts and other events scheduled for this season are online at jmarts.org. Jennifer Trejo Benitez of Jordan-Matthews High School auditions for Sing and Play ’19, a musical competition open to elementary, middle and high school students throughout the area. She was one of 18 student acts selected for the showcase concert on February 21. Jack and Jillian Dixon of Silk Hope School audition for Sing and Play ’19, a musical competition open to elementary, middle and high school students throughout the area. The duo will perform on February 21 at 6:30 p.m. in the Sing and Play showcase concert at Jordan-Matthews. Joseph Walden, left, and Greg Burriss evaluate auditions for Sing and Play ‘19. Audiences will select the winners in separate elementary, middle and high school competitions during the Sing and Play showcase concert on February 21 at Jordan-Matthews High School.